Which Kind of Wood Should You Use for Smoking Meat? Once upon a time, all food was cooked over a fire. The smoke from the wood flavored the meat, giving it a sweet and smoky characteristic. Flash forward to today, where we cook most of our food over electric or natural gas stoves. We haven't forgotten about our humble beginnings, though - we still respect barbecue and the powerful flavor that comes from smoking meat. 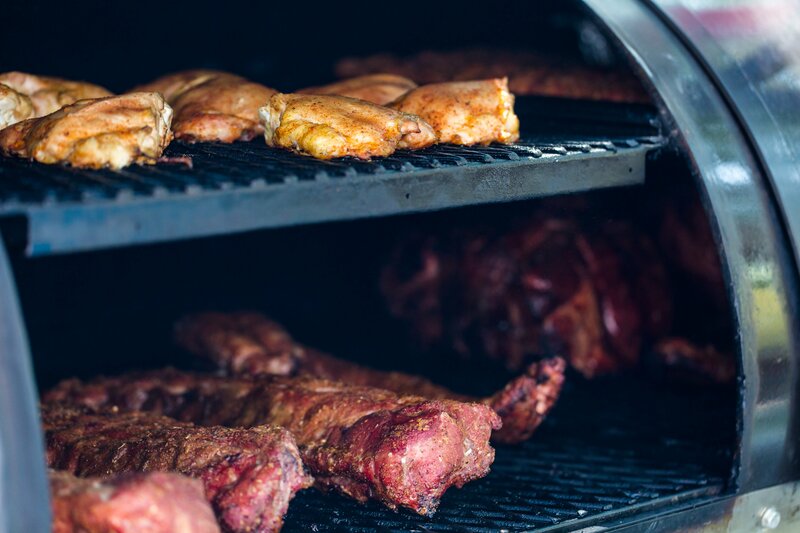 The smoke is what makes barbecue so iconic. While any type of wood works to infuse smoke flavor into your food, each type adds a unique flavor and aromatic element to your food. Not all smoke is created equally, and some smokes are better suited for certain meats and big game. So let's take a look at the unique characteristics of each fuel source. Smoking wood plays a role in the flavor and the color of the meat. It also forms a bark, or crust, on the meat. In general, mild woods are good for fish and poultry, medium fruit woods are best for poultry, or pork, and strong woods hold up against dark red meat flavors. The wood often comes as wood chunks, wood chips, or pellets-wood chunks allow a steady, slow release of smoke, while wood chips and pellets are quicker to smoke. In the end, you don't need to overly obsess about woods. At my house, we usually smoke with apple wood because it's good for almost anything and it's the best wood for the job at hand. Sometimes I'll mix and match small amounts, but I usually make amazing barbecue just using apple. It's is so mild and all-purpose, it never takes over the meat and allows the meat's natural flavors to shine. But, if you want to experiment, here's the lowdown on each wood and which meats each is best for. Hardwoods (also known as deciduous trees) include fruit and nut woods. Their cell structures are compact, making them ideal for being a smoking woo. Softwoods (evergreen or coniferous trees) include pine, spruce, fir, hemlock, redwood, and cypress. These are airy woods that have more sap, making them pungent and burn fast. They're not recommended for cooking. Alder has a subtle smoke flavor with a natural sweetness. This lighter wood is my first choice for smoking salmon, but it's great choice for any fish. It can also be used for poultry. Try it with this smoked salmon recipe. This wood imparts a mild and sweet flavor to your food, making it a popular choice for poultry, vegetables, and cheese. Maple's sweet smoke also gives the meat a dark appearance. Great when mixed with different woods such as oak, apple, or alder. 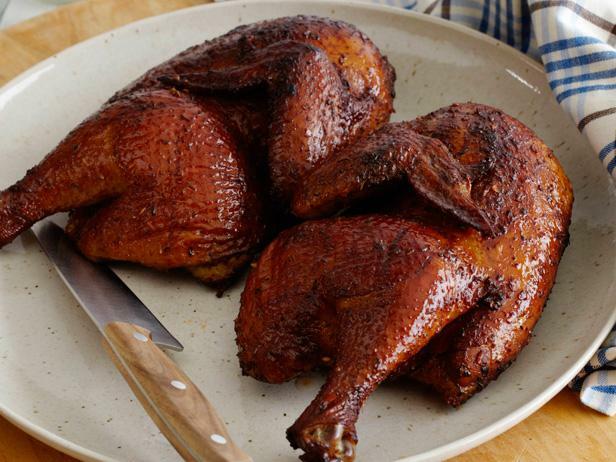 Try this recipe for maple smoked chicken. This fruitwood is mild, fruity, and subtly sweet. This is my go-to choice for all-purpose smoking needs. It's particularly popular with poultry, pork (especially ham), lamb, and sometimes seafood. It works for beef, but its flavor is so delicate it doesn't hold up to red meat's heavy flavors so a lighter wood is recommended. This is a great blending wood when mixed with stronger woods, like oak or mesquite. Check out this applewood smoked chicken recipe. Cherry is another great all-purpose fruitwood for all types of meat. Its sweet and mild flavor works well with beef or pork, and the smoke turns meat a rich, mahogany color. This smoking wood mixes well with hickory, oak, pecan, or alder. 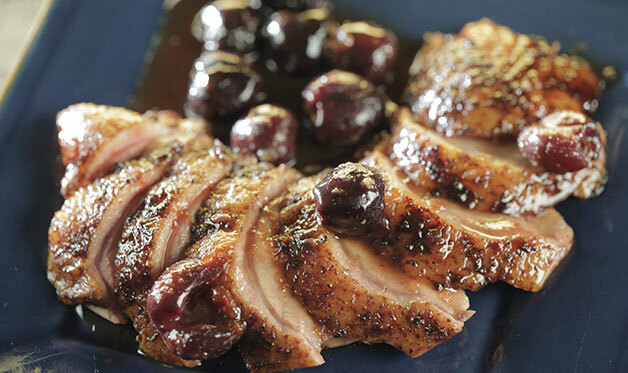 Try cherry wood with this recipe for smoked duck. A stronger wood than apple or cherry, but lighter than mesquite or hickory. Oak burns very hot, making it a great blending wood and very versatile. It imparts a medium smoky flavor that works well with any type of meat. 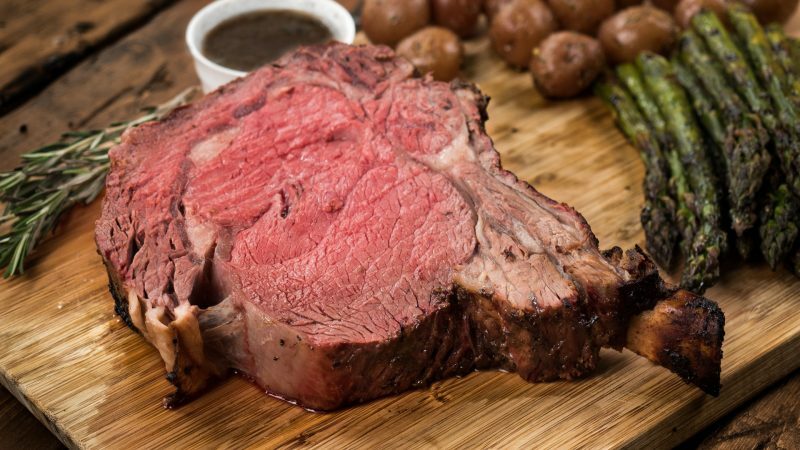 This recipe for oak smoked prime rib is a great way to check out the power of oak. These fruitwoods are very similar to each other. They have light, sweet, and fruity flavors that make them ideal for pork or poultry. These types of woods are harder to find but their subtle flavor is worth the search. Try this recipe for peach wood smoked turkey breast. This popular wood is a midwest and southern barbecue favorite. It's so strongly associated with bacon that some people say that hickory-smoked food reminds them of bacon! It has a strong, pungent smoke that adds strong sweet and smoky flavors to meat. It's especially popular with bacon and pork ribs. Be careful with this wood, because over-smoking with hickory causes aggressive, bitter tasting foods. 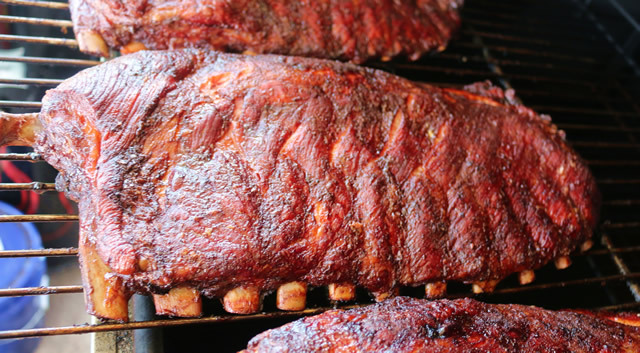 Check out this recipe for hickory smoked pork ribs. Pecan wood is actually part of the hickory family. While it's not as strong as hickory (although stronger than fruitwood), it belongs in the strong wood category because it can become pungent and bitter if used in excess. The wood burns cool and imparts a delicate flavor to meats when used properly, making it choice for poultry or pork. 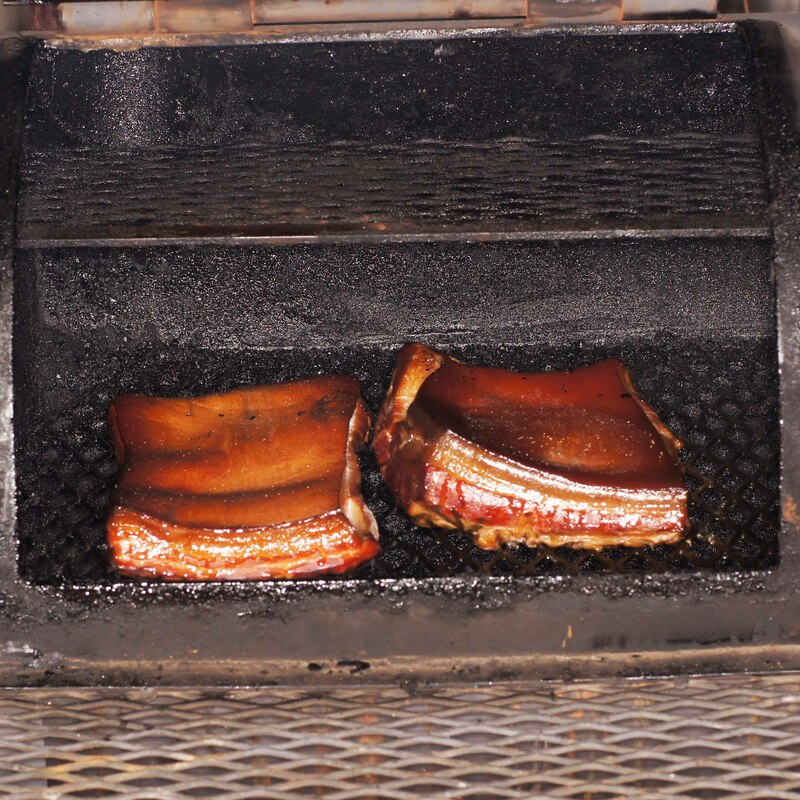 Try smoking with pecan with this bacon recipe. This wood is often used as a mixing wood because of its tendency to impart strong, bitter flavors to meat. Because it has such a strong flavor, it's ideal for red meats or game meats. 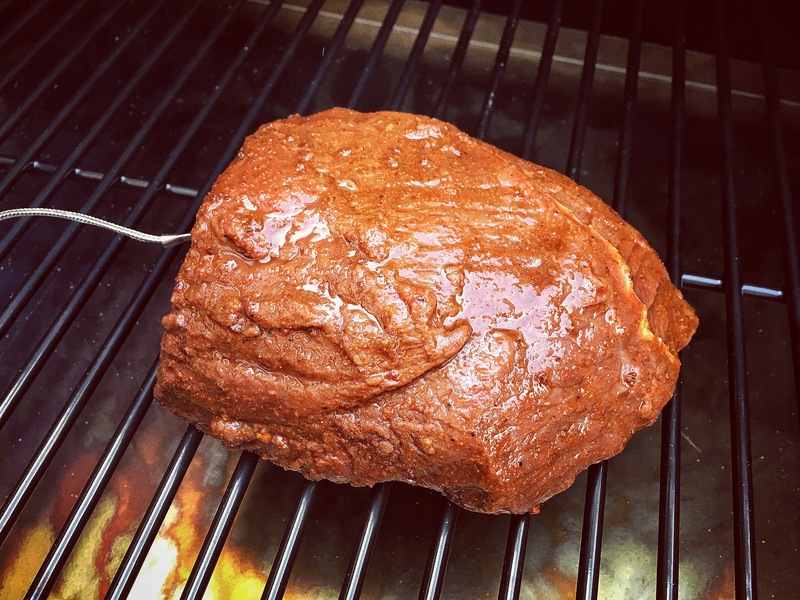 Try using walnut in this recipe for smoked venison. This one is in a category of its own. It can be harsh and bitter if used incorrectly, but strong and have an earthy flavor if used correctly. It is an oily wood so it burns strong, hot, and fast. Since it burns so fast, it's not ideal for long barbecues. It's extremely strong flavor holds up well to dark meats, but it would be a terrible choice for lighter poultry or fish. Blending this wood is definitely recommended to get until you get to know how it works. 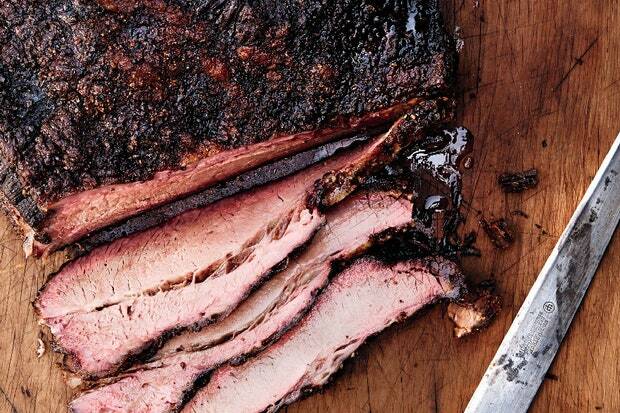 Swap in mesquite to cook up a real classic Texas Brisket with this recipe. It's official - all this talk of wood is making me hungry! I'm ready to fire up the smoker, call myself a pit master and throw a party.